Preserved foliage is natural plant material that has been harvested from live plants and trees, and then preserved to maintain thier natural beauty for years. Preserved foliage - unlike dried, brittle foliage that crumbles easily- looks and feels 'alive' as the preserving formulas and process includes maintaining natural moisture at the plant's cellular level.Preserved foliage is the absolute very best in capturing realism. Very elegant. 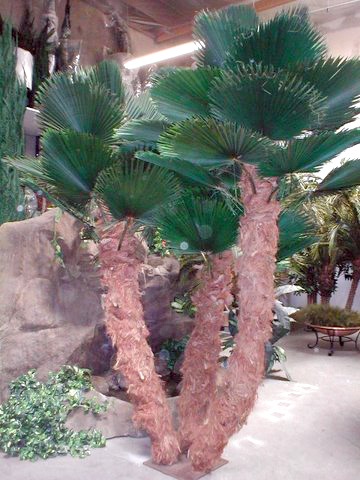 Features a lovely large canopy of internally preserved fronds on natural trimmed trunks. Available in clusters of 2, 3 or 4 trunks and heights to 25 feet. 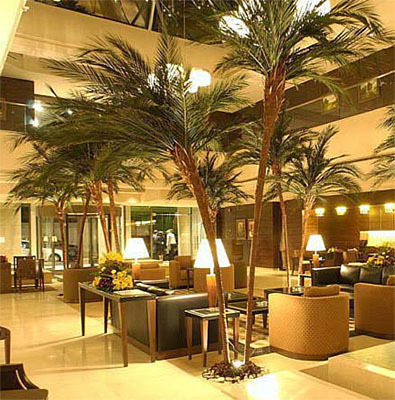 Shown right, even the single trunks "planted" in-ground offer an elegant tropical ambiance (Safir Heliopolitan Hotel - Beirut, Lebanon). Also, we provide a twenty-year warranty on the trunk and two-year warranty on the fronds. For a larger picture, click image. 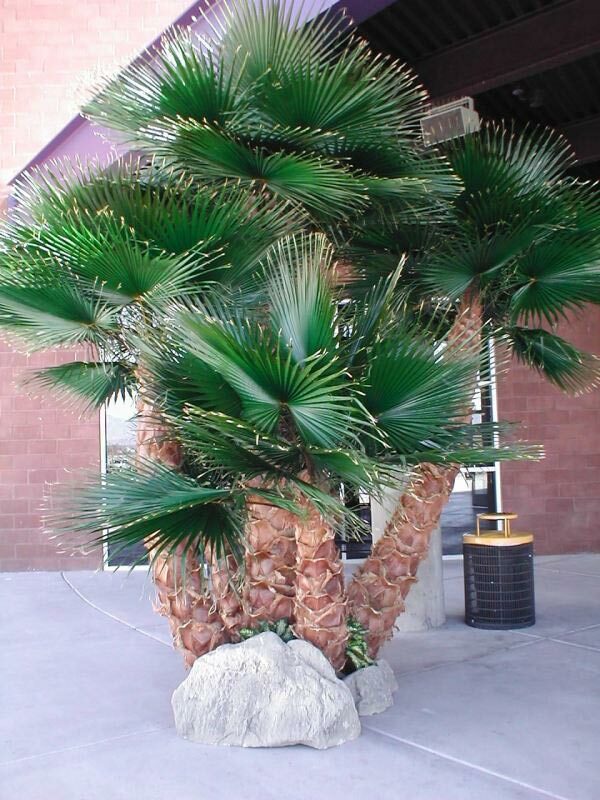 Preserved Date Fronds in natural Phoenix Canrienses Rachis Bark & Palm fiber bases. Lush, graceful, natural and very adaptable to many design needs as shown. 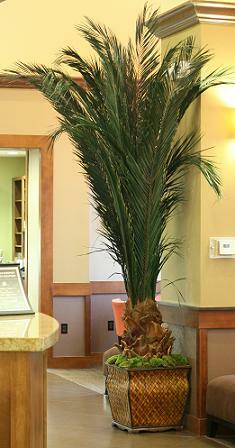 Picture shown 36” tall trunk tapered from 10” dia. Top to 24” dia. Base. 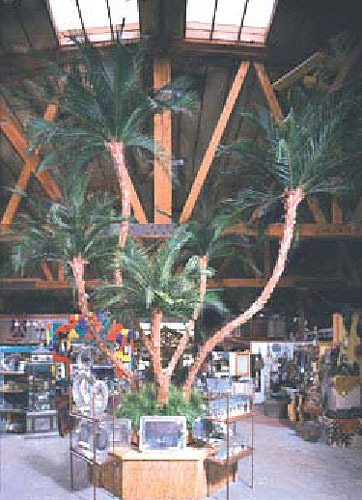 Includes (#48)- 48” long internally preserved fronds, 18”x18” base steel base plate, over all height 8’ft. Title #19 Certified F.R. Available for all interior preserved palms. 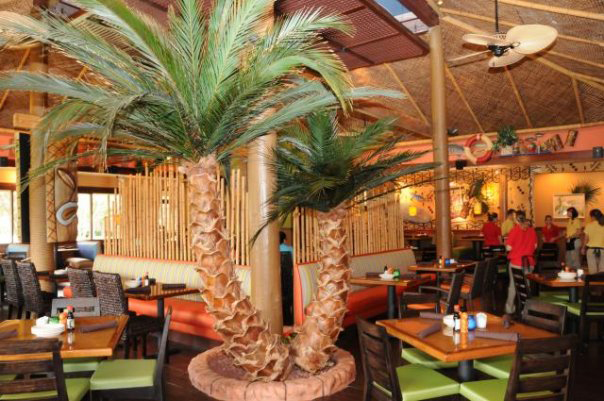 Attractively suitable for in residences or commercial applications when a bushy, tropical feel is desired without the traditional palm trunk and canopy or where height is restricted. Features internally preserved fronds on molded, hand-painted trunks with natural palm wood and fiber accents at top of trunk. Available in clusters of 2 to 6 trunks and in a variety of heights from 4 to 18 feet. Also, twenty-year warranty on the trunk and two-year warranty on the fronds. An all-time favorite with natural bark trunks fiber and internally preserved fronds. Heights available to 50 feet. 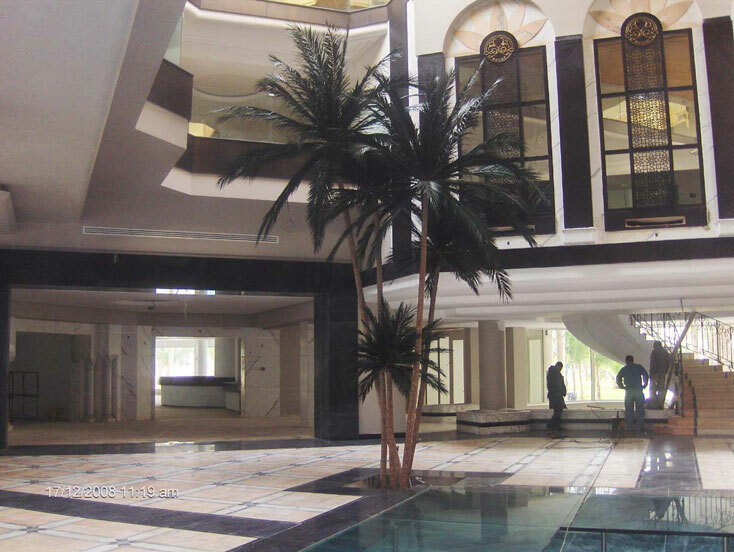 Canopy sizes and shapes can be modified to suit your space and desired look, (please remember to specify under-canopy clearance desired if including shorter (15 foot and under) trees where people will be walking under). 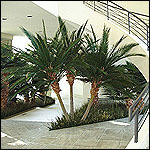 We can provide extra-long fronds for an elegant look where fronds drape low. Internally preserved phoenix date palm; standard straight trunk. Net trunk height 18’ft. plus 1 ft. PVC pipe extension, all welded internal steel head and support structure within PVC pipe and high density foam interior. Head tapered from 8’’ dia. Top to 24’’ – 26’’ dia base. (bark to bark); trunk with real natural bark. Includes(#43) – internally preserved 6’ft. long fronds, steel base plate 24”x24”. Canopy footprint @ 12’ft. 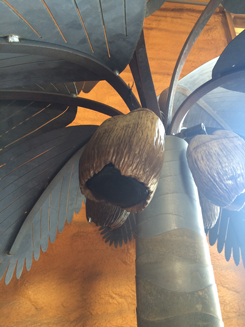 All of our natural bark trunks include welded-steel baseplates and densely packed bark segments per linear foot. 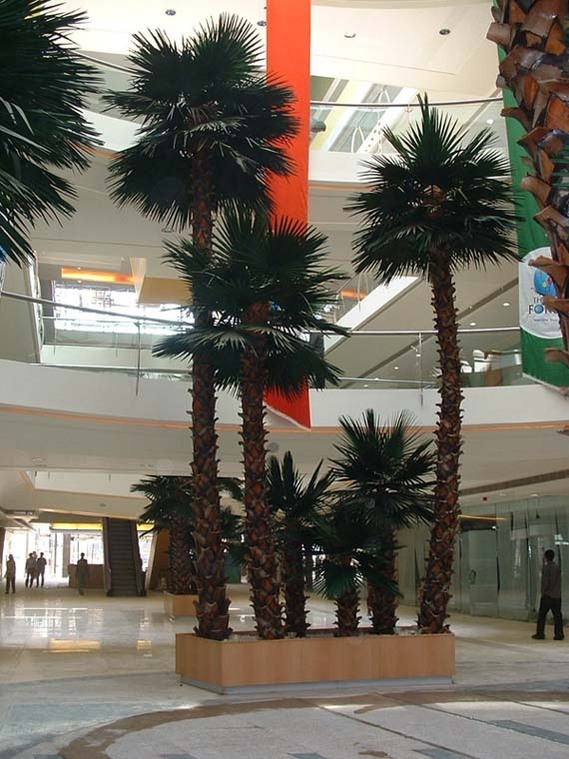 Our frond heads include additional receivers to hold more fronds for lush, full presentations. A steel base plate is provided for support and an "in-ground" appearance such as shown to the right. 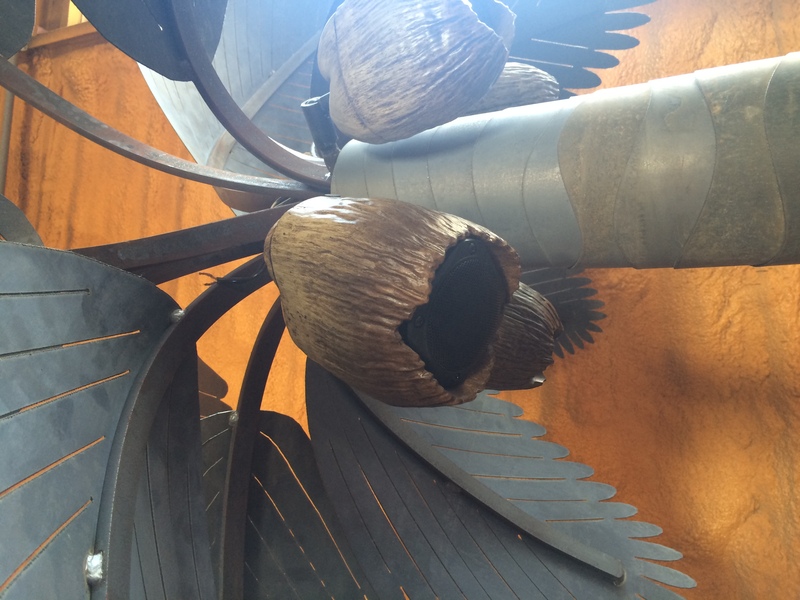 Natural Palm Fiber and Wood D�cor Trunks, each curved to create full, untamed tropical ambiance. Distinctive styling offers a more natural, untrimmed look. The Irian Jaya features narrower, highly curved trunks with Preserved Phoenix Fronds. 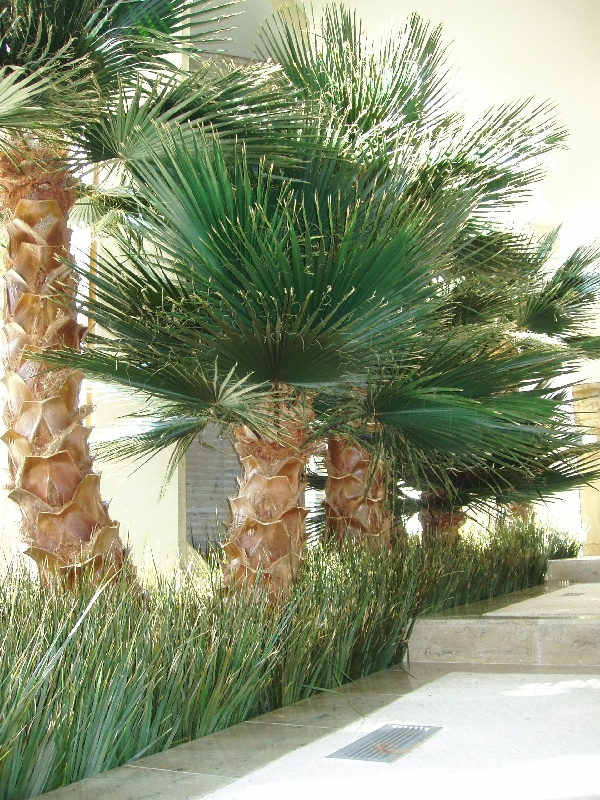 The Mediterranean features thicker, more gently curved trunks with Washingtonia Fan Palms. 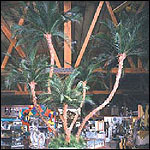 The Mediterranean Cluster Palm consists two or more trunks which can be straightened or curved to your speicification. 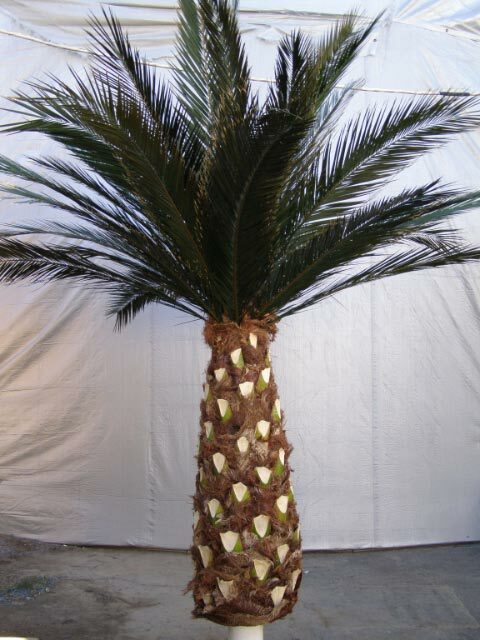 This beauty is ideal for larger areas needing a fresh tropical look. 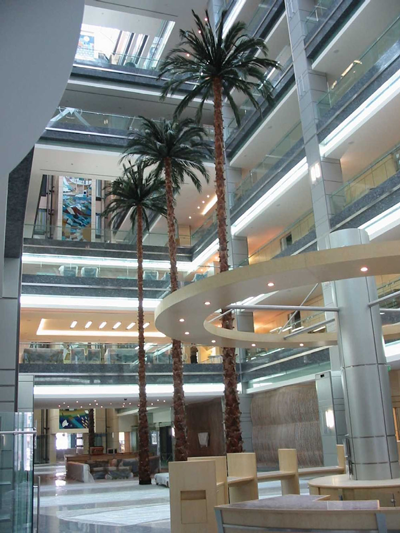 An excellent tree for medium to large installations. 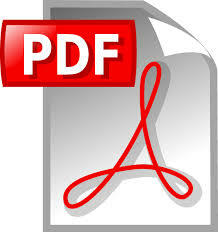 Height: 6 to 15 feet high in single or curved multiple clustered trunks. 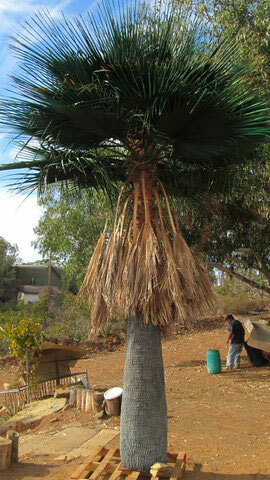 An all-time	favorite with natural flared bark trunks fiber and internally preserved	fronds. Heights available to 50 feet. 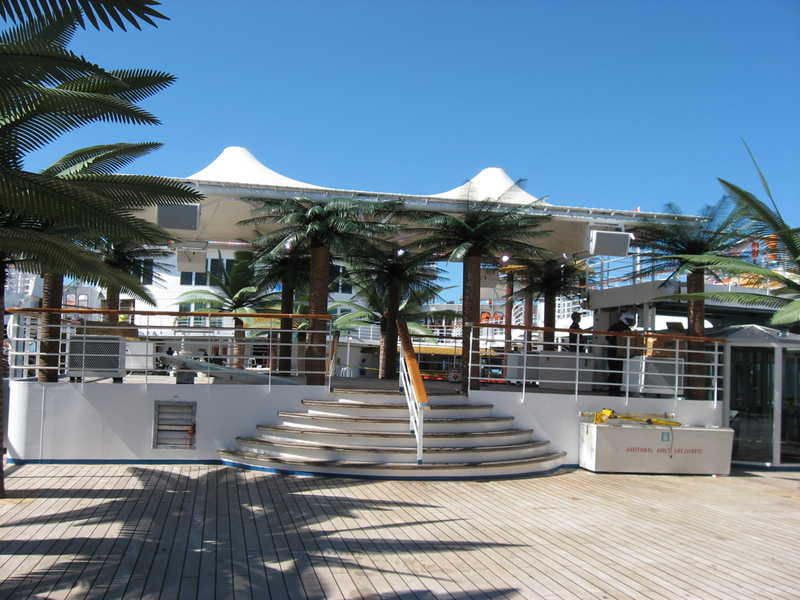 Canopy sizes and shapes	can be modified to suit your space and desired look, (please	remember to specify under-canopy clearance desired if including shorter (15 foot and under) trees where people will be walking under). 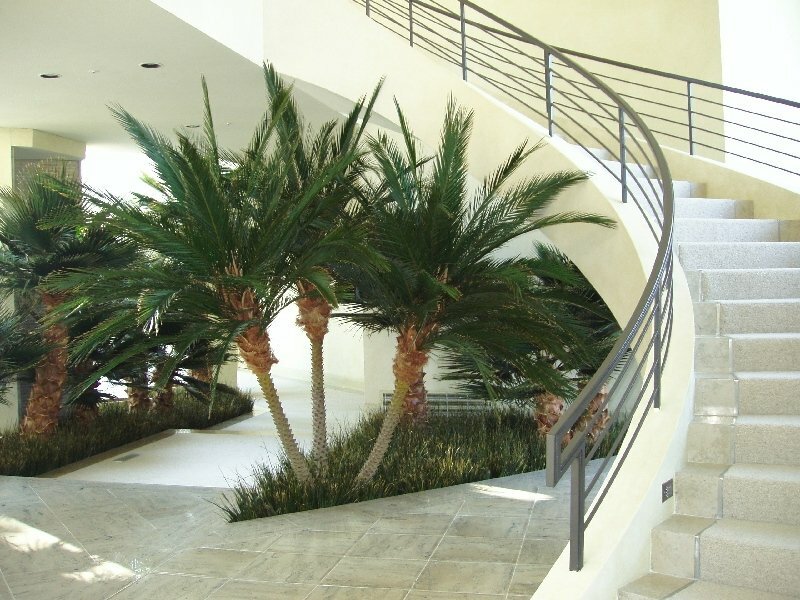 We can provide extra-long fronds for an elegant look where fronds drape low. Features internally preserved fronds on molded fiberglass hand-painted trunks with natural palm fiber accents at top of trunk. Available in clusters and in a variety of heights. Features internally preserved fronds on molded fiberglass hand-painted trunks with natural palm fiber accents at top of trunk. Available in variety of heights. Features internally preserved fronds on molded resin hand-painted trunks with natural palm fiber accents at top of trunk. Available in variety of heights. 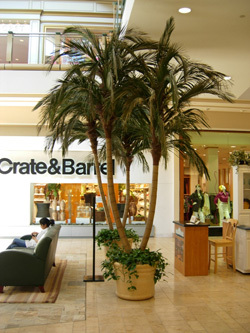 Shown right, even the single trunks "Mounted" in-planter Or bolted to the floor offers an elegant tropical ambiance Also, we provide a twenty-year warranty on the trunk and two-year warranty on the fronds. Very elegant. 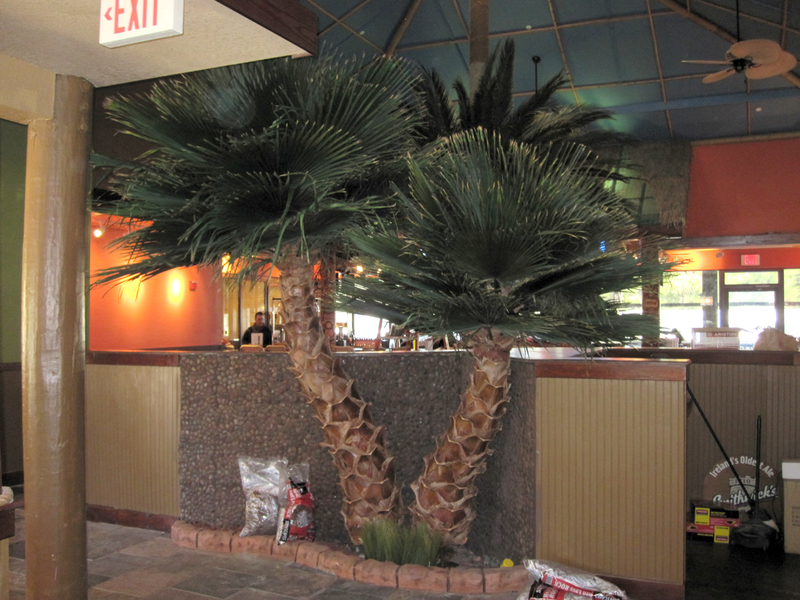 Features a lovely large canopy of internally preserved fronds on natural trimmed trunks. Available in clusters of 2, 3 or 4 trunks and heights to 35 feet. 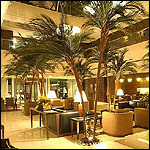 Shown right, even the single trunks "Mounted" in-planter Or mounted to the floor offers an elegant tropical ambiance. Features internally preserved fronds on molded fiberglass hand-painted trunks with natural palm fiber accents at top of trunk. 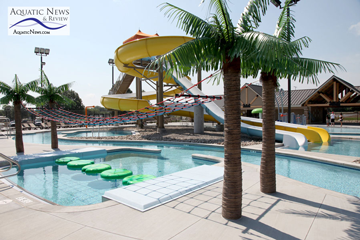 Available in Straight and Curved in a variety of heights from 10'ft. to 40'ft. Overall Height. Also, twenty-year warranty on the trunk and two-year warranty on the fronds. 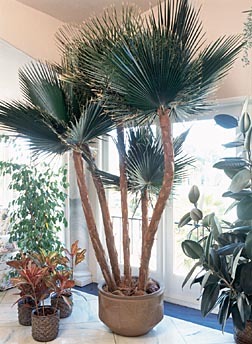 Coccothrinax "Replica " : A three trunked cluster palm with long fibrous hair that clothes each trunk entirely . The CIFR Preserved palmate fan foliage is almost circular with short dentate leaflets at the tip of the fronds, which has a short petiole. 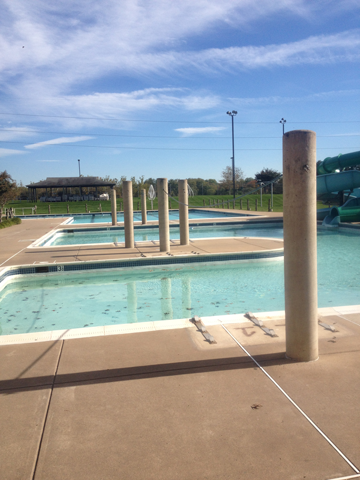 The trunks have a low "C" curve shape. 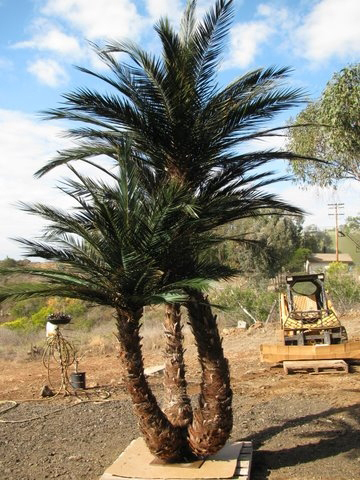 The palm sizes range from 12 ' to 30 ' OVH in multiple trunk clusters. All internal steel in trunks and mounted on a Steel Base Plates with trunk receivers all welded. 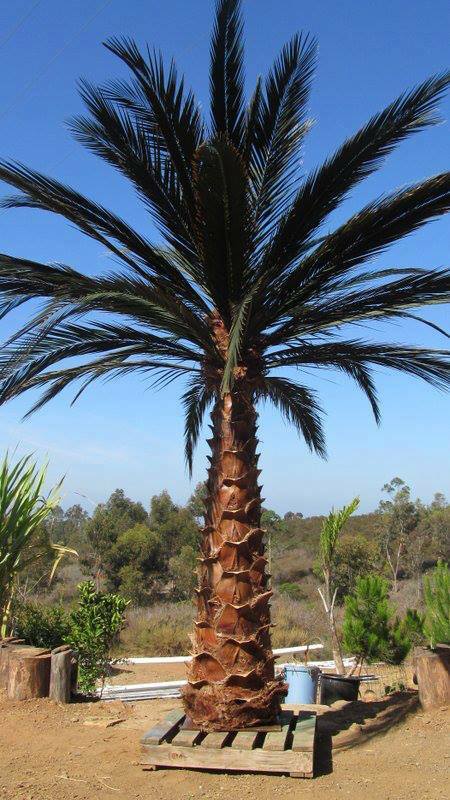 Washingtonia filifera -replica with CIFR Palmate preserved fronds - A solitary trunked palm with skirted dead fronds attached over skinned woody swollen trunk. size ranges from 16' to 36' OVH. All mounted on steel base plate with welded steel receiver. Multi-trunk Low"C" & "S" curves with real P. reclinata bark and trunk fiber with CIFR Preserved Phoenix fronds. All internal steel ,all mounted on steel base plate. Size ranges from 10' to 30' tall in clusters of 3# trunk . Very elegant. 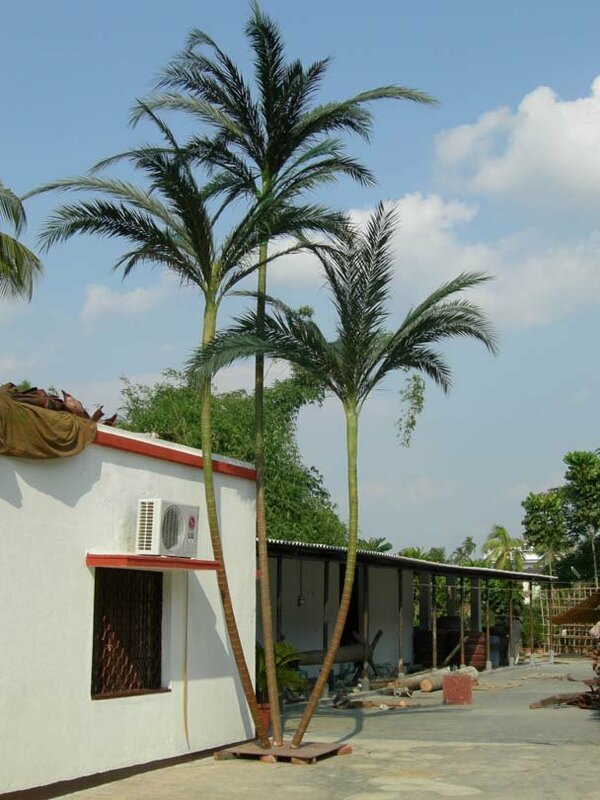 Features a lovely large canopy of internally preserved fronds on natural Areca trimmed trunks. Available in clusters of 2, 3 or 4 trunks and heights to 35 feet. 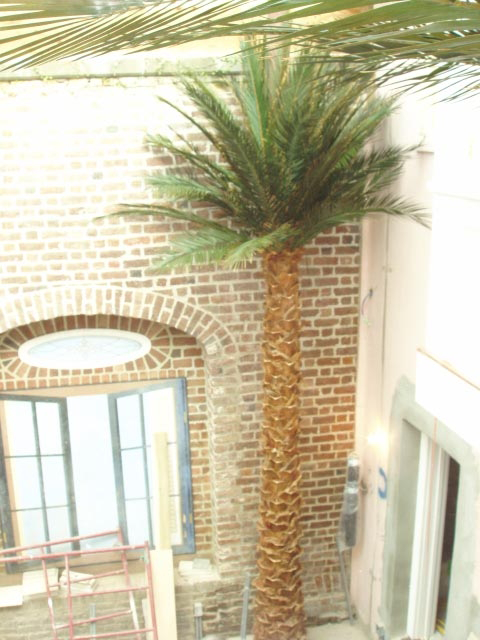 We custom build an assortment of column wrapped palms, including preserved Phoenix & Washingtonia palms and preserved Italian cypresses. 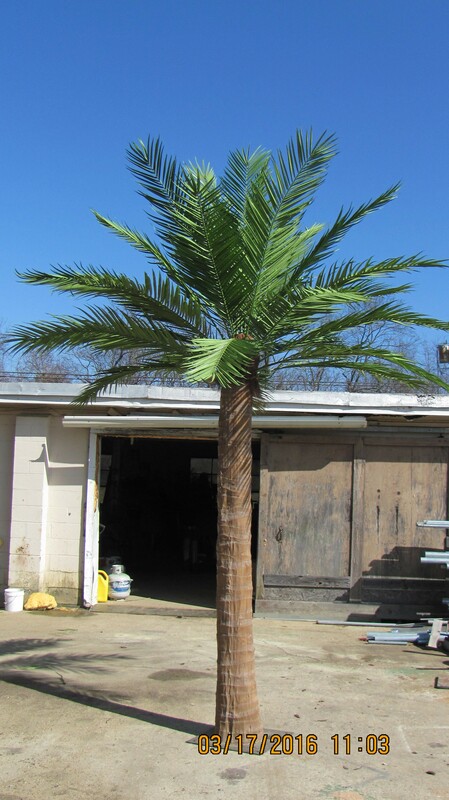 These palms are used to accommodate steel I-beams, concrete pillar posts, cellular telephone poles and towers, walls and structural beams. Each installation is site specific, custom designed to meet our clients needs. Our wraps are available for interior use. 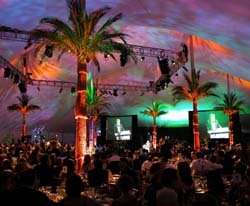 Rentals Available: Palm Tree Tent Pole Wraps By E1,Ltd. 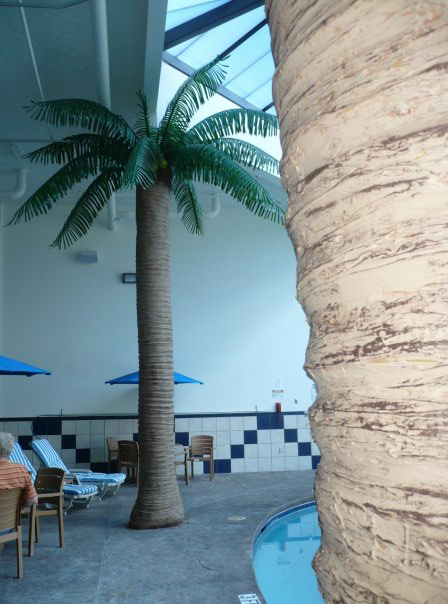 We custom build an assortment of Artificial Column Wrapped Palms, including Poly Ethelene Fronds and a Synthetic Rubber Molded Trunk. 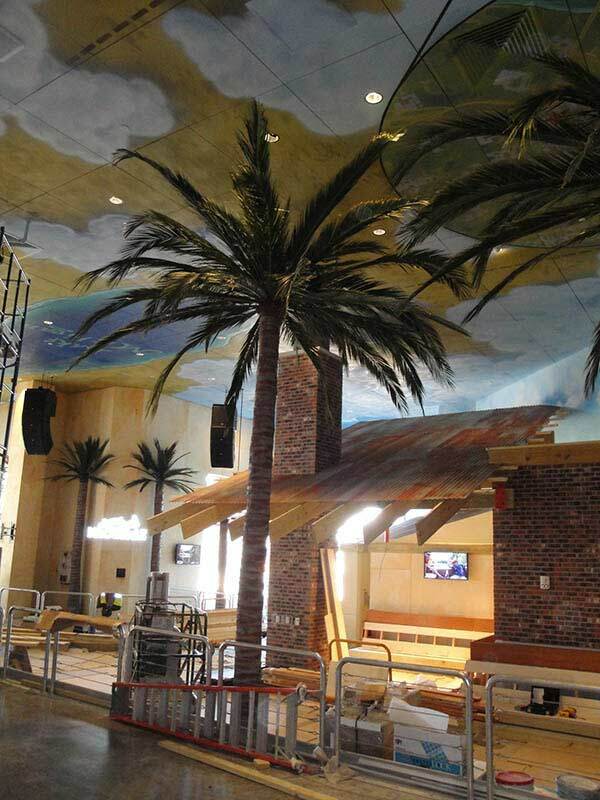 These column wrap palms are used to accommodate steel I-beams, round support poles, concrete pillar posts and structural beams. Each installation is site specific, custom designed to meet our clients needs. Our wraps are available for interior or exterior use. 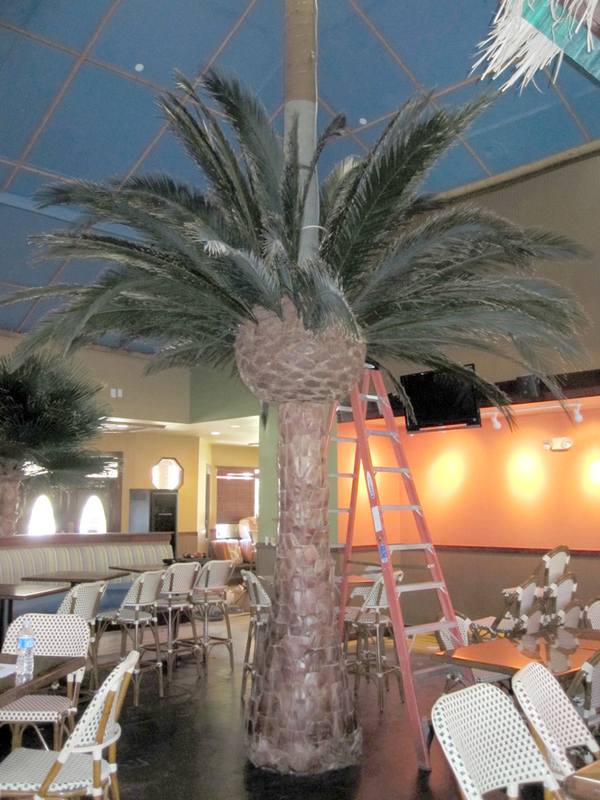 Coconut Column Wrap Palm We custom build an assortment of column wrapped palms, including preserved Phoenix & Washingtonia palms and preserved Italian cypresses. Website Maintained by GoViral Web Design LLC.